The FDA has approved a St. Jude Medical spinal device that treats chronic pain not relieved through traditional spinal cord stimulation. 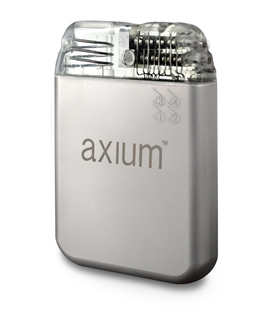 The St. Paul, Minn.-based devicemaker's Axium Neurostimulator System is for use on the dorsal root ganglion, a spinal structure that contains sensory nerves that transmit information to the brain via the spinal cord. The therapy helps with moderate to severe chronic pain in the lower limbs of adult patients who have complex regional pain syndrome. Stimulating the dorsal root ganglion, also known as DRG, allows physicians to treat the specific area where the pain is occurring, like pain from knee, foot or hernia surgery. The company says the device will help patients whose pain is nerve-based but not adequately relieved through traditional spinal cord stimulation or other treatment options. “The addition of DRG stimulation to our portfolio demonstrates our continued commitment to ensuring physicians have the broadest range of meaningful chronic pain therapy options,” said Dr. Allen Burton, medical director of neuromodulation and vice president of medical affairs at St. Jude. Amid a growing number of opioid overdose deaths being recorded throughout the country, the Centers for Disease Control and Prevention recommends patients try alternative therapies when possible. It's generally thought that opioids are less effective in treating chronic neuropathic pain conditions such as complex regional pain syndrome, though there has been some data to show that opioids can reduce pain and improve quality of life in the short term. The study used to evaluate Axium was the largest to date evaluating patients suffering from neuropathic chronic intractable pain associated with complex regional pain syndrome or peripheral causalgia, a similar condition. At both three months and 12 months after beginning treatment, patients treated with Axium reported stronger pain relief than those treated with traditional spinal cord stimulation. Axium is expected to be available in the U.S. in the coming months. The system received European Union approval in November 2011 for the management of chronic intractable pain, and is also approved in Australia. In addition to DRG stimulation, St. Jude's neuromodulation portfolio also includes chronic-pain therapies that employ spinal cord stimulation and radiofrequency ablation. The company is also developing deep-brain stimulation technologies for the treatment of movement disorders.